SLS® Production Series Production 3D Printers Tough end-use parts, faster and more accurate The industry’s best combination of part durability and surface finish, 3D Systems’ family of advanced Selective Laser Sintering (SLS®) machines are raising the bar in direct manufacturing and functional prototyping. SLS 3D printers by 3D Systems produce true, functional thermoplastics with the highest resolution and surface finish of any other SLS process. 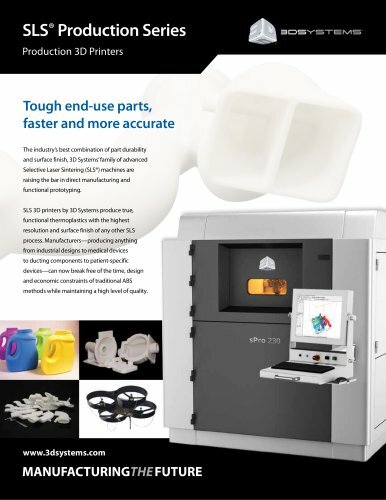 Manufacturers—producing anything from industrial designs to medical devices to ducting components to patient-specific devices—can now break free of the time, design and economic constraints of traditional ABS methods while maintaining a high level of quality.